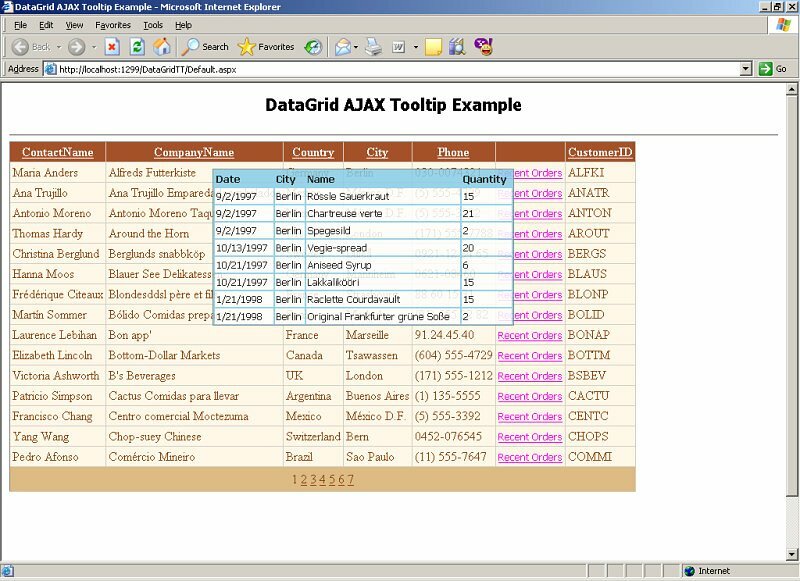 This article is about creating a AJAX based tooltip for the ASP.NET DataGrid. In a simple demonstration, I'll show how to put things together and get them working. The main page consists of normal DataGridView, showing customer information and a template column which says 'Recent Orders' . When the user moves his/her cursor over the text, a cool animated translucent tooltip appears for the row, showing ten recent orders by that customer. 5. Some experience with ASP.NET and datagrid. Download the prototype.js and add it to the project. Modify the web.config file of the downloaded project. Change the 'NorthwindConnectionString', so that it points to the 'Northwind' database on your server. 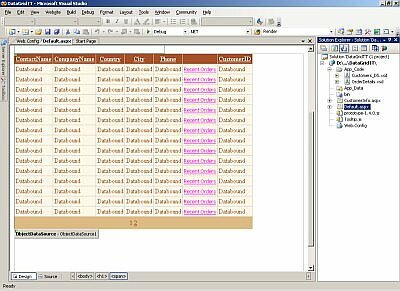 This is how the datagrid looks in designer. The column with 'Recent Orders' is a template column with a 'Label' control over it. You should be able to figure out things if you have Visual Studio 2005 and the source code. There is nothing really special here. Creates the tooltip using a hidden tag as template. Called when window.load fires. This function is called using prototype libraries 'Event.observe' mechanism. Initiates an AJAX request for the 'custId' to fetch data from the sever , using 'Ajax.Request' method from prototype.js for AJAX. Shows 'Loading...' text in the tooltip. 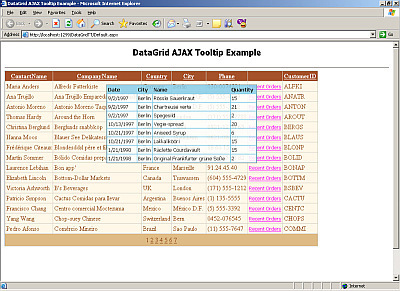 Processes the response form server, creates pretty looking HTML table containing the data and shows it into the tooltip. Hides the tooltip Refer to the Default.aspx file for the code of these functions. Here one important thing I would like to tell you is to place the datagrid in a with some descent height. This is required for proper functioning of tooltip. So when the mouse pointer moves over any 'Recent Orders' label 'showDetails()' needs to be called and 'hideTooltip()' when it moves out of it. All the above code does is attaching appropriate function calls to the 'onmouseover' and 'onmouseout' events of the label in the template column. Also notice the 'CustId' is also getting passed for the corresponding row. This is very important for the system to work. Thats it , we are done ! I strongly recommend that you should download and study the code a bit before trying out this. This was just an example where we considered a simple case. With more creativity and code , it will be possible to produce more useful functionality and spectacular looking interface. Please email me your opinion, suggestions and criticism at .